Precast concrete walls are extremely beneficial for construction projects, and can save huge amounts of time, effort, and money. If you’re working with precast walls, you need precast embed products so you can safely and reliably move, lift, and anchor them. 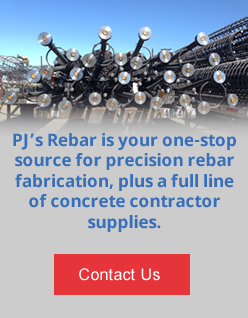 PJ's Rebar is your leading resource for standard and custom precast embed products. With our own in-house manufacturing capabilities, we can produce precast embed products that match your specifications. Simply send us your design drawings, and we will create custom rebar components for your unique project. We work with all rebar sizes/grades from our massive inventory, as well as metal plate and other related materials. The possibilities are almost limitless! Request a price quote on standard or custom precast embed products, or contact PJ's Rebar for more information.